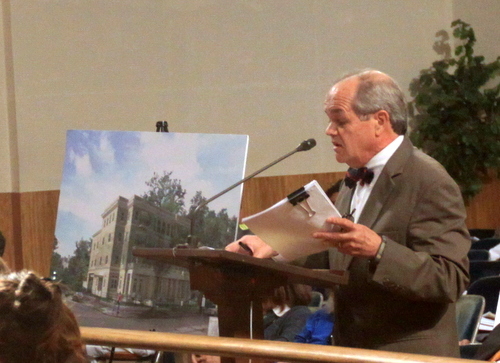 A new condo building on St. Charles Avenue in the Garden District received approval from city planners on Tuesday, but a larger condo project intended to replace an apartment complex at State Street and Tchoupitoulas was recommended for denial — and city officials are still waiting on more information about the redevelopment of the former Sara Mayo hospital in the Irish Channel and another development at the major intersection of Washington and South Jeff Davis in Gert Town. All together, the projects represent 500 new condo and apartment units in neighborhoods around the Uptown area. Phyllis Landrieu, a former Orleans Parish School Board member and aunt of the mayor, plans to replace two small homes at the corner of St. Charles Avenue with a 57-foot-tall condo building with 10 three-bedroom condo units inside and a pool and gym on top. Landrieu and her supporters said that the two “ranch-style” homes are out of character with the grand nature of St. Charles Avenue, and that the proposed $5 million building will enhance the avenue’s appearance. Landrieu’s building would be adjacent to another condo building in the same block, and it was residents of that structure who provided the most opposition to her proposal. They said they had a petition of 90 neighbors in opposition, and argued that the new building will take up too much of the lot and be too close to their building. “Along St. Charles, tall buildings detract from the ambiance of the avenue,” said Helen Ulrich, one of the opponents, suggesting that the nearby Louise McGehee School buildings be a good model for future height limits. Andre Gaudin, president of the Garden District Association, said he understands that there are already taller buildings on St. Charles Avenue, but that he wants the trend to stop. “We are concerned that the avenue will become a fortress of buildings on either side,” Gaudin said. Planning Commission Chair Kyle Wedberg noted that the existing condo building on the block is larger than the one Landrieu was proposing. While he said that Gaudin brings up an issue that bears further discussion — the tipping point for neighborhood change — he said he felt the Landrieu proposal was worth supporting, and the commissioners voted 5-1 in favor of recommending its approval. At State and Tchoupitoulas streets, developer Jim MacPhaille is planning to replace the 13 red-brick apartment buildings with a single condo structure with 49 units inside. Attorney Justin Schmidt said he has more than 500 letters in support of the project, and said the current structures would be unwelcome in Metairie or Kenner, much less just blocks from Audubon Park. “This is not the model we want for our city,” Schmidt said of the existing buildings. Keith Miller, a nearby neighbor in support of the project, said the apartments have hindered the growth of Tchoupitoulas Street with crime, trash and other issues. “The vast majority of the neighbors support the project in this area,” added Audubon Riverside Neighborhood Association member Evan Plauche. Other neighbors, however, were not so enthusiastic. Tchoupitoulas resident Dara Hoell praised the angular orientation of MacPhaille’s building on the lot, but said its size would dwarf the surrounding homes. “I don’t think this is the model we want for the neighborhood,” Hoell said. MacPhaille’s project also faced a more significant opponent: the city planning staff. Their report argued that the Master Plan for the city classifies the area as residential low-density, and that in it, multi-family housing such as apartments can be preserved, but not torn down and replaced with new multi-family projects. Commissioner Robert Steeg said while there is a consensus around removing the existing apartments, the Master Plan is clear that they should only be replaced with single- or two-family homes, and proposed accepting the staff’s recommendation to deny the project. Commissioner Kelly Brown added that she believes that the future of the property is not limited to a choice between the apartments there now and MacPhaille’s vision for a condo, and said he should pursue a development with a lower density instead. With that, they voted 6-1 to recommend denial, with Commissioner Nolan Marshall III the lone vote in MacPhaille’s favor. He said after the meeting that he believed the commission has more discretion with regard to the master plan’s requirements, since the condo project met all the other density regulations. “I thought the developer did everything he could to try to accommodate the neighbors,” Marshall said. A development consortium is proposing the redevelopment of the former Sara Mayo hospital on Jackson Avenue into mixed-use project with 211 residential units and commercial space on the ground floor. At Tuesday’s meeting, members of the City Planning Staff said the project was a good use for the long-neglected former hospital, but that the proposed density was too high. Instead, they said, 111 units was a better number for the property, and proposed to delay a decision for 30 days for further negotiations with the developer. Attorney Ed Suffern said his clients are in favor of the deferral. They want to conduct more detailed research into how many rooms were in the former hospital, in case that figure has bearing on the density for the new project. “We may have an entitlement by way of grandfathering,” Suffern said. Another major project pending before the City Planning Commission is the Parkway Apartments at 4650 Washington Avenue, near the Blue Plate Lofts. The developer wants to tear down the existing single-story building there and construct a five-story building with 228 apartments and 15,000 feet of ground-floor retail, as well as parking for more than 300 cars in a covered garage. 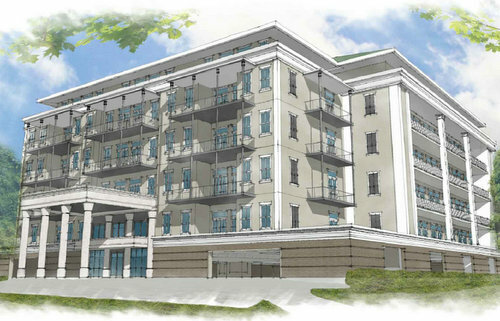 Each floor above the first will have more than 40 one-bedroom units and about 13 two-bedroom units. The second floor will have a rooftop courtyard and pool deck, according to the application, and apartments will rent for between $1,200 and $1,600 a month. Like the other projects, the planning staff generally supported the plan but recommends reducing the density, from the proposed 228 units down to 207. With little discussion, the planning commission also deferred a decision on that project for 30 days. All of the decisions by the City Planning Commission will require final approval by the City Council. The commissioners are wrong not to allow the condos on tchop. They said there’s not supposed to be large buildings… Well it’s across the street from two hospitals and the largest port in the United States. I don’t think a 5 story condo building will hurt at all. There’s too much single family residences uptown. Nola needs density! Want to solve our housing shortage and fight gentrification? Fire the entire planning staff. It’s always lower density, fewer units, more parking. We need the exact opposite and every single one of the projects is an improvement. If we want better streets and more police, then we need more people living in the city to pay for it. Well if the developer was related to Mitch – he would have gotten it approved like his mama did.